President Obiang Nguema Mbasogo from Equatorial Guinea attended the Elysee Summit for Peace and Security in Africa, which focused on issues surrounding security, development, and economic partnerships within the region. The summit was held on December 6th and 7th. In light of recent events, African leaders commemorated the death of Nelson Mandela and agreed to engage in military intervention to stop the escalation of violence in the Central African Republic. President Obiang Nguema Mbasogo along with fifty-three other delegates from African countries and France, and various representatives from the United Nations, the African Union, the European Union, the International Monetary Fund, the World Bank and African Development Bank. 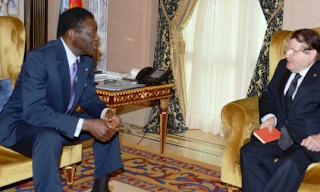 President Obiang had a personal meeting with President Alpha Condé of Guinea Conakry in Paris. The two discussed relations between the countries and the possibility of joint oil and resource ventures. President Obiang also spoke with the Ikililou Dhoinine, the President of the Union of Comoros, and is now expected to make a visit to President Dhoinine in Moroni, Comoros. Overall, the delegates expressed their commitment to security and human rights, and France pledged to help the African Union achieve full capacity of the African Standby Force and the Rapid Deployment Capability. Leaders of the African countries in attendance gave their approval for French military intervention in the Central African Republic. The outcome of the summit initiated an important dialogue between Africa and France. The discussions that took place have helped create a greater understanding of the current threats affecting African nations. Rector D. Carlos Nze Nsuga, from the National University of Equatorial Guinea (UNGE), recently signed an agreement with Texas Tech University (TTU) to establish a future collaboration between the two universities. 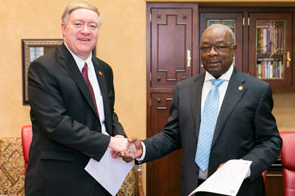 The cooperation between the National University of Equatorial Guinea and Texas Tech University will foster the development and exchange of publications, data and other materials; share information regarding the scientific meetings and seminars that each university organizes, share documents and publications resulting from those activities. The agreement also encourages student exchange programs. It aims to foster the participation of teachers, researchers and students in courses, seminars or conferences to be organized in each institution; support temporary exchanges of students, provided they meet the requirements; develop research projects, preferably joint ones, involving researchers from both institutions; support joint participation on international inter-university cooperation programs; support cultural and sports exchanges between the two institutions; support the groundwork and training for doctoral theses. Following the agreement, UNGE will make a formal invitation to Texas Tech scholars and teachers to visit Equatorial Guinea to become familiar with UNGE’s capabilities in agribusiness in order to define the specific needs of cooperation. UNGE will also invite a TTU professor to teach courses within TTU’s Masters in Business Administration (MBA) program in Malabo. Regarding sports, UNGE will send staff to TTU to learn the management of sports facilities. On the administrative management curriculum, UNGE plans to send staff to TTU to learn from their expertise in this area. Student exchange programs have been a high priority to UNGE’s curriculum and they plan to send their students to TTU for Post-graduate programs.